Looking for a subcontractor invoice template that will work for your business? We've got you covered. Do I need more than just a subcontractor invoice template? As a subcontractor, you are probably up to your neck in paperwork. Moving to digital invoices can help. That's where we come in. Our free subcontractor invoice template can help you set up an invoice template specifically for your business. You can even add your logo to the top. ZipBooks also has an auto-billing so you can charge your regulars easily by just creating one invoice and setting your preferences. 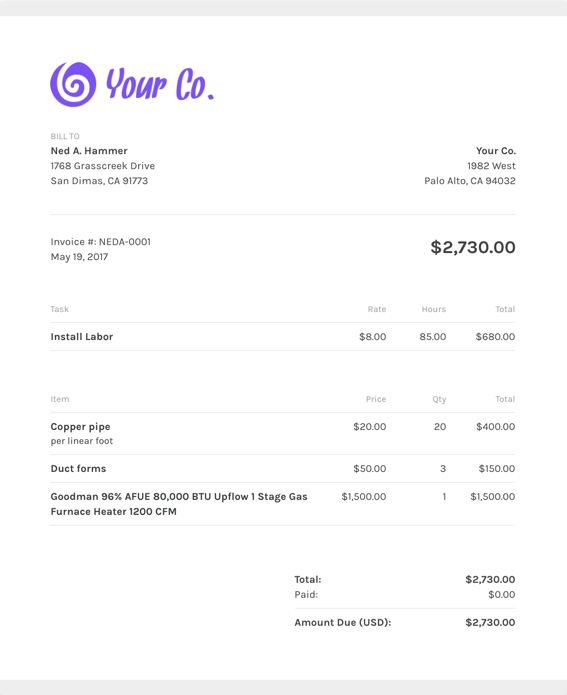 What should I include on my subcontractor invoice template? Using ZipBooks for your subcontractor invoice means never sending off an invoice without your own company’s information on it (oops!). We’ve collected data from tens of thousands of invoices and use it to score your invoice based on what information you include so you’ll get you paid faster. Why should I use ZipBooks’ subcontractor invoice template to create and send my subcontractor invoice?